Each isolation gown features extra strong cuffs, waist and neck ties, and sewn seams. The gowns are also made from fluid repellent materials and are latex free. 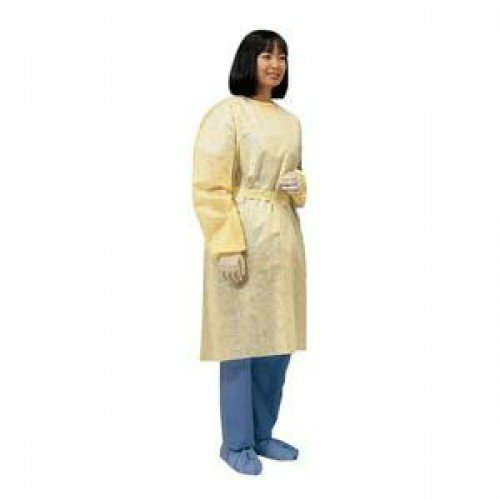 This makes these isolation gowns both durable and versatile in many patient care applications. According to the manufacturer, 42.
these gowns have a good tight wrist band and fit well. the back and neck tie offs are a good length and the gown is comfortable to wear over all. the only downside is that they can puncture or tear pretty easily. Vitality send me my order very quickly too. I would definitely recommend these to anyone. We use this all the time. We all have this gown at work. We use them when we have to enter rooms of high risk patients to avoid contamination. It's also great to sterilize because it really is durable and not affected much by heat or chemicals. All medical staff wear this when needed.